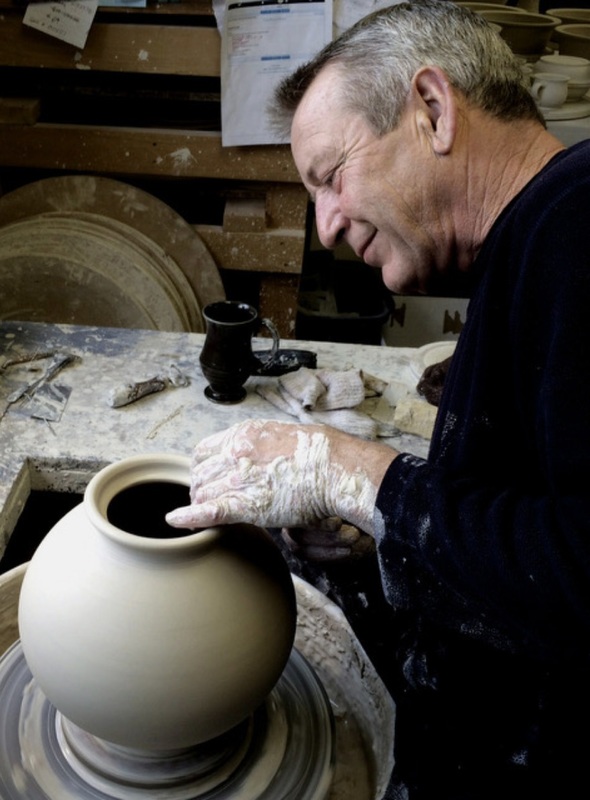 is an annual round of handmade ink production in collaboration with an artisan vessel maker. Inks are produced in limited quantities in a custom setting that shows off the skills of the collaborators. LAUNCH DATE: MAY 10th 2018 — Sold Out. This is a special formulation of traditional iron gall ink. The inclusion of logwood gives and ink with an immediate purple-black. The ink will oxidize to give a permanent, waterproof, black - as dark and profound as a starless night. 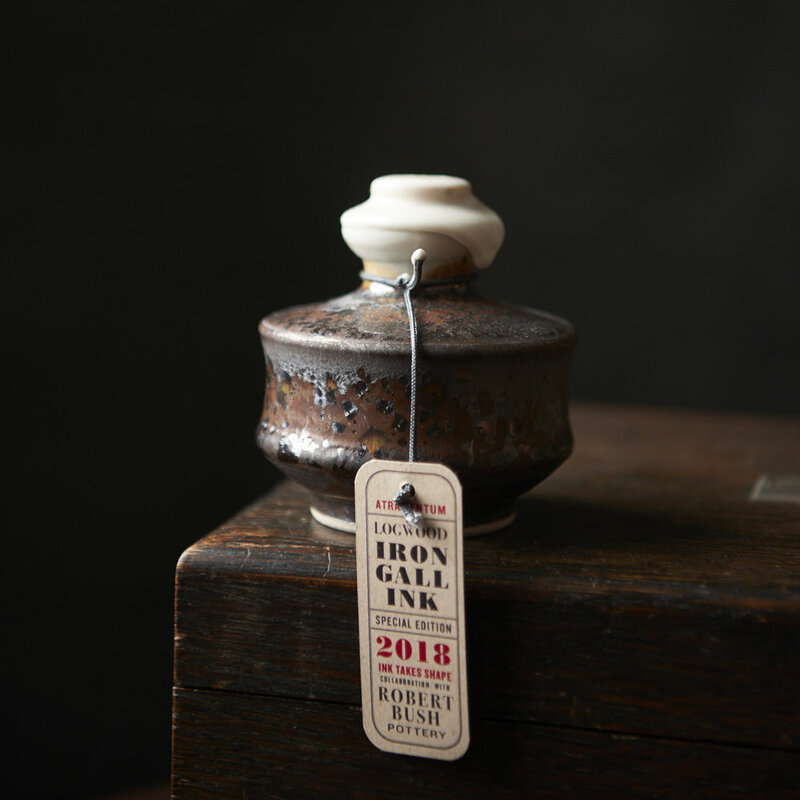 Iron gall inks give clear hairlines and bold blacks when used for pointed pen or Spencerian calligraphy. The inclusion of logwood permits a significant reduction in the amount of ferrous contained in this ink. This is a special vintage edition ink formulated by inkmaker Tim McLaughlin. The edition is part of the 2018 INK TAKES SHAPE project — a collaboration with British Columbia potter Robert Bush. 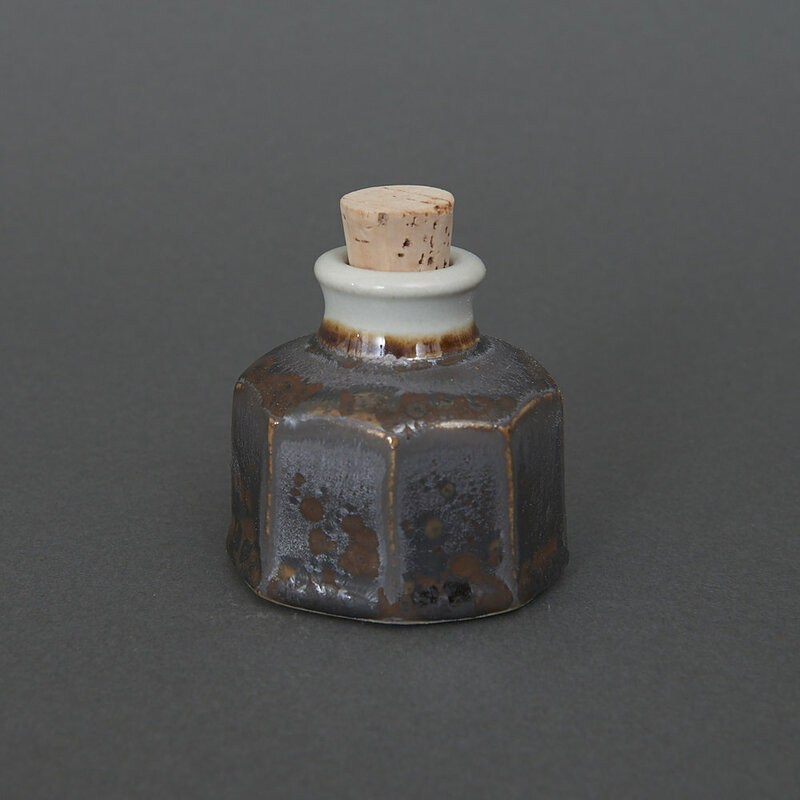 Each pot of ink is in a hand thrown, porcelain vessel, commissioned especially for this ink. 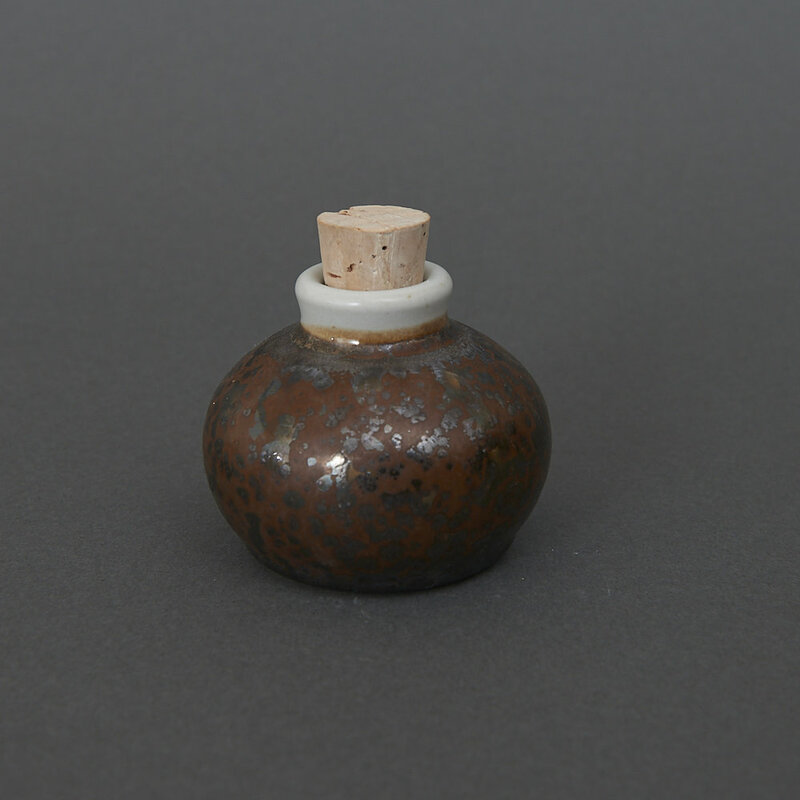 Each pot holds approximately 100ml (3.5 oz.) of ink. The pots are stoppered with a cork and sealed with wax. Each pot is numbered - there are only 40 pots in this edition. The collaboration is part of the 2018 "Ink Takes Shape" project. For dip pen or brush. Iron gall inks are not suitable for use in fountain pens. Shake gently before use. A graduate of Vancouver's Emily Carr College of Art & Design, Robert Bush is known for his innovative crystalline glazes and wheel-thrown pots. 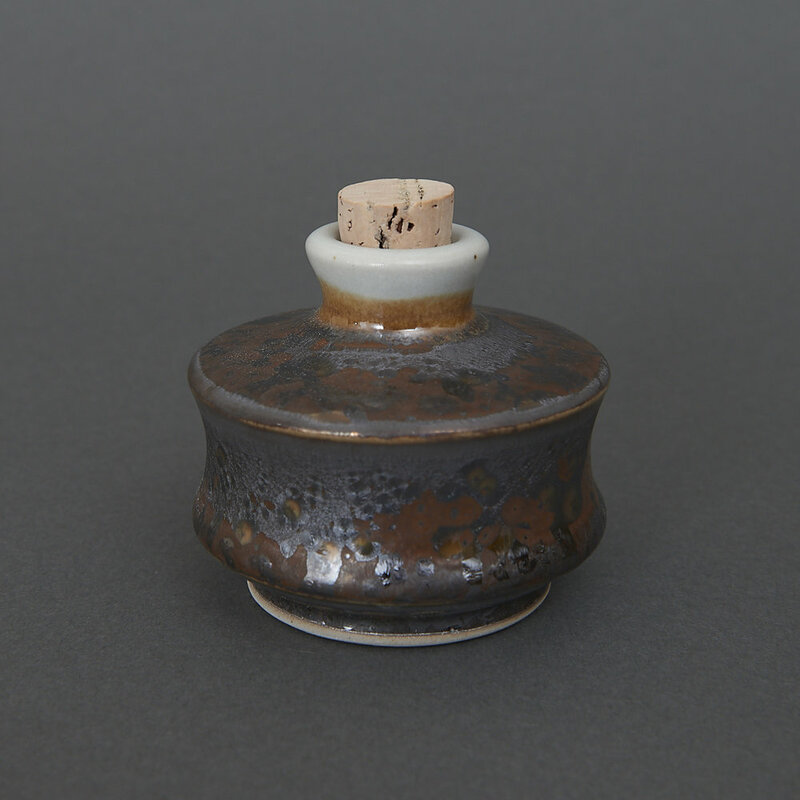 He works in stoneware and porcelain using high fire reduction. Since 1981 Robert has been a member of the Circle Craft Artist's Co-operative and his work may be found in the Circle Craft gallery on Granville Island, Vancouver. Robert maintains an active studio practice. Works may also be found on his facebook page. A big thank you to Robert for being the first INK TAKES SHAPE collaborator.